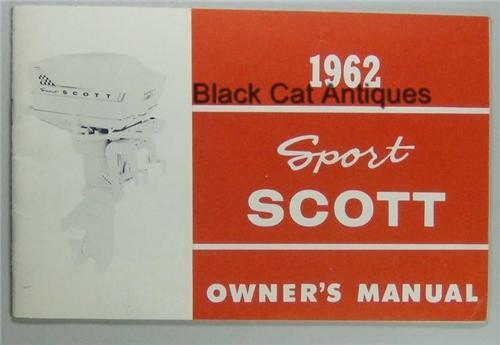 Up for sale, we are offering an original, 1962 Outboard Motor Owner's Manual for the Sport Scott, 27.7 HP model. Please enlarge photo #2 to verify the model covered by this guide. This is a new/old stock manual from a local marine and small motor business filled with great diagrams and information relevant to these classic outboard motors. While transporting these brochures, catalogues and sell sheets, we noted a oil smell that had permeated the paper, reminding me of the dark small rooms that were so full of the racks and boxes and bits and pieces that made up the old stock of this business. It reminds me of the marinas I use to hang around as a kid. Condition: This manual is new/old stock with light soiling on the cover from storage. Please enlarge the photos to determine the condition of the guide. Size: The manual measures approximately 8.5" wide by 5.5" high. Be sure to check the photographs for relevant information such as makes and models covered. Please be aware that some of these booklets may include information about other products that the manufactures sold, expect a little salesmanship about lawnmowers, chainsaws and such in some of the manuals. This can give you an interesting glimpse of other items of the period. We do combine shipping to save you money wherever we can. It takes us a bit to pull the appropriate manuals and get back to you with a combined cost. If you are in a rush, pay for the individual shipping and we will refund the difference once packed for shipping.